WindTunneling enables new options for leaders, options that reflect all the participants’ unique perspectives as they evolve from pools of ideas into more firmly formed options for action. In the process, everyone involved understands better how “the system works” and also learns important new ways to contribute for the benefit of the whole organization. Social Capital grows in the form of healthy relationships based on engaging equally with transparency and candor. Emerging insights strengthen both individuals and groups. What do you wish you knew that would help you make better decisions? WindTunneling is designed to help us work with Complex Issues, AND its design embeds specific Systemic Principles. The discussions below elaborate Complex Issues and our Systemic Principles. The short answer is that complex issues are those issues that are messy, chronic and highly uncertain. They have many elements and variables, and many of the variables are beyond our control. In the present, we can’t tell if A is causing B, or if B is causing A….or neither. At best, we may be able to look back and see a pattern of cause/effect….but we have to make decisions in the present. We cannot “solve” complex issues: the best we can do is to actively and continuously improve our position. The shape of leadership that yields the most productive results when we are facing a complex issue is “systemic leadership.” It is very different from hierarchy or from bringing in consultants who purport to “solve” the issue. This set of leadership practices and approaches is built out of three disciplines: chaos and complexity theory; living systems theory; and the theory/practice of tapping the experiential learning of all those involved in the system or organization (collective intelligence). WindTunneling is specifically designed to support leaders and managers….and their teams….as they arrive at work facing more and more complex issues. Let’s take a closer look at how Complex Issues compare with other types of issues. This is a chart that has been adapted from the work of David Snowden. It is called the “Sense Making Framework.” It lets us decide how to shape our leadership and approach to an issue based on the characteristics of that issue, rather than based on our personal style or preference. 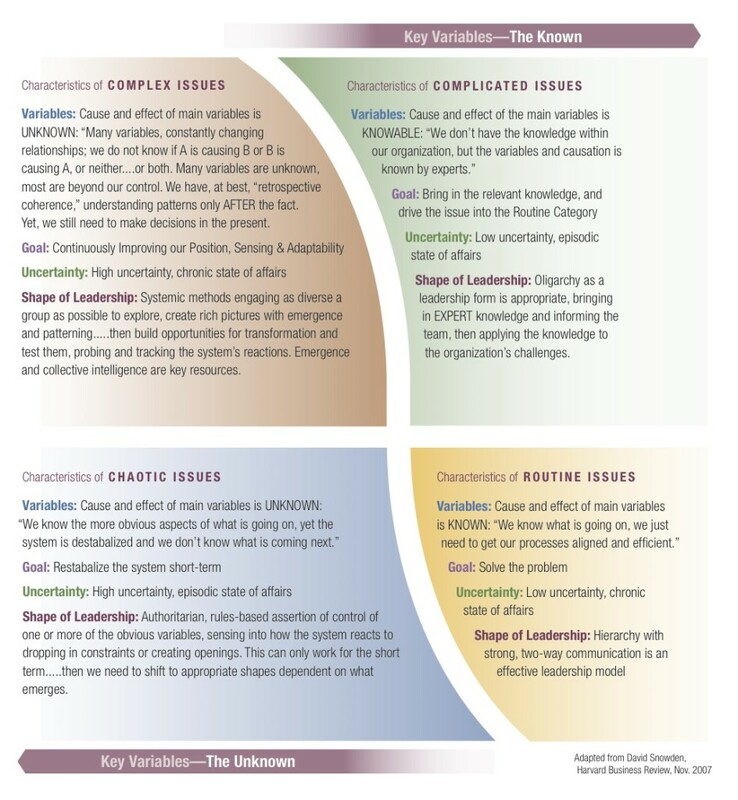 This framework is significant because WindTunneling is especially useful in working with the issues we face that are Complex, that share the characteristics of the upper left quadrant. WindTunneling can be useful to help build communication networks and relationships as we approach our Complex Issues. We have found that as we build our organizational capacities to manage Complex Issues, when Chaotic Issues strike (and they will), we are better equipped to re-stabilize our systems. 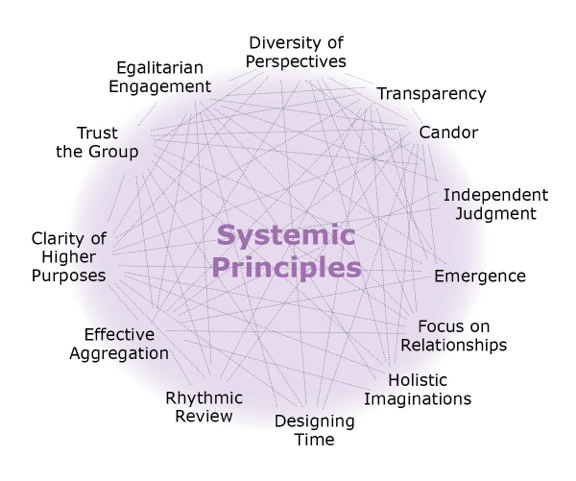 What are Systemic Principles, and why do they matter? The short answer to this question is displayed in the following graphic. Brief explanations of each follow. WindTunneling is designed to incorporate ALL of these principles. This provides learning by the participants, impetus for culture change, while promoting optimization of complex issues management. The complex issue is constantly shifting, and has many moving facets. No person, at any given time, has full knowledge of causation and emerging changes. Thus, quickly being able to have dozens of perspectives, each from a diverse angle and experience, gives us the best chance to illuminate a richer and dynamic picture of what the qualities and essence of the issue at that moment. Each perspective offers a fragment of the whole. Patterns and themes can emerge when all participants have ready access to dozens of points of view. As we begin to build a rich picture of a complex issue, we don’t know who in the organization holds the key pieces of information or perspective that can open up productive pathways. Thus, those high in the organization leadership contribute their ideas along with those in the middle and lower levels of the organization. Everyone’s ideas are contributed to the commons with the same size of pen, so to speak. Everyone brings what he has and the more productive ideas become self-evident….regardless of whose idea it was. Silos, hierarchy and gatekeeping…along with time pressures keep us from engaging all of the ideas, insights and knowledge that lives with our organization. WindTunneling is designed to quickly elicit relevant knowledge from everyone. If we lack relevant information, we draw conclusions that are often erroneous or unproductive. If we all have full access to the ideas and perspectives of a diverse group of colleagues, all of which have a unique view of the issue(s), we are quickly able to see patterns and connections that elude us if we are blocked from that robust information. When dealing with complex issues, the future is an amplifier of uncertainty: we need courage to address these issues pro-actively. Transparency and the trust that emerges from it supports Systemic Leadership. WindTunneling supports quick and rhythmic revisiting of wide sharing of diverse perspectives. In many organizations, staff and leaders alike have learned that telling “their truth” or “sharing their perspective” often has negative consequences. Consequently, withholding of ideas, insights, and information is mostly the common culture. However, if we are not speaking what needs to be spoken, we are unlikely to productively address it. Chaos and calamity are usually the triggers for disclosure. Collateral damage can bring down organizations. In WindTunneling, all contributions are anonymous because we have found that participants have much to share that is highly valuable, and they want to share it. Our anonymity policy is hosted in the sign-in page. Of course, when a group decides to put their names on their contributions, they are free to do so. In many group processes or strategic planning sessions, the facilitator or consultants “take what everyone has shared” and then makes sense of it, refines it, and puts it into a final report form. Our experience is that much of the quality of the original ideas and relationships is lost or distorted. WindTunneling enables the group to organize and make sense of their contributions, assessment, and insights. Through doing this work, the participants learn much more about the complex issue(s), the relationships, and the possibilities. Our experience is that the participants are excited to build out options and share the work: their level of ownership and support for the outcomes is also high. The software makes this work quick and it is not seen as burdensome from a clerical perspective. To avoid “group think,” where individuals give over their independent views to peer pressure, WindTunneling is set up to invite everyone to share their individual, independent ideas. The program is “gated” so when the gate is open at the set date, everyone gets to see everything. This promotes each individual to consider his/her contribution(s) and not give over to those who easily dominate in a face-to-face meeting. There are rounds of comments in WindTunneling, where each participant can comment on the ideas of others. Again, we are seeking many independent perspectives. WindTunneling also offers different modes where the project can operate in “open flow” where everyone is writing and reading simultaneously. Depending on the culture of the group, “group think” may not be such a significant pressure. In systemic methods, we are seeking to build rich pictures and from our view of a larger “whole,” we begin to identify patterns and what are called emergent ideas. These ideas may not be specifically identified or worded by a participant, but the reflect a shared experience or theme that appears in various parts of the original set of contributions. Emergence is a phenomenon of all systems: new things emerge from existing conditions, and WindTunneling is designed to elicit emergent ideas as all of the participants review and reflect on all of the contributions of their colleagues. As we share our multiple perspectives about the complex issue before us, we begin to see that we may have a confusion about the higher purpose(s) of our organization. This is a strength because if we are pulling in different directions, yet we think we are pulling in the same direction, we not only wallow, but we blame others for being “uncooperative” or inept. Our organization may have multiple higher purposes, and if we can clarify and prioritize them (for timing and resources) we are more consistent and we will be more competent in managing the issues before us, as they shift and evolve. In working with systems, what we learn is that there are nodes or elements of a system, and there are the relationships among given sets of those nodes. Given that the nodes are always changing, the relationships among the nodes are always changing. WindTunneling enables groups of participants to quickly share what they see from where they sit (in a node), and thus the shifting relationships can reveal themselves more readily. Better options for adaptation emerge along with stronger personal relationships across silos. An interdependent organization with information flow among the nodes/participants is a great support when outside risks or opportunities appear. In any organization, individuals have primary areas or scope for their unique work. WindTunneling enables participants to see “the whole system” in play, and thus they are able to hold larger imaginations of how things work and what is possible. Participants are not limited in the number of contributions they can make, and this invites them to imagine into a much broader space than just their cubicle or department. Participation also invites new staff to quickly get a grasp of the whole, and how things seem to be functioning. What we have been, as an organization, may not be who we could be: throughout the organization reside holistic imaginations that might hold the organization’s future. What is real is that change is constant and accelerating. What often happens in group work is that there is a “product or report” that is generated, and then it sits in a binder or a few things change. WindTunneling acknowledges that having opportunities to review and quickly re-interpret or add new insights offers organizations “living thinking” as opposed to our former practices of “being done.” In complexity management, the idea of “done” is “done.” WindTunneling projects can be weekly or biweekly or monthly or quarterly….and they are quick and non-burdensome. The insights can give a lens into how change is unfolding and where to redirect resources, if appropriate. Strategic Plan(ning) is the activity that WindTunneling supports as an ongoing process: The Strategic Plan (fixed) is a non-systemic way of naming and thinking. Over the past decade, more humans are shifting their relationship to time and information “processing.” We are used to “click and go” from our computers and phones. We are impatient to get to the gist of what we are seeking. WindTunneling is designed to enable participants to contribute and reflect on the ideas of others when it is convenient to them. They can plan and they can participate without travel. At any stage of a WindTunneling project, the group can print out the findings and work off line with the ideas or assessments. Yet, the benefit of virtual communication with teams around the world is powerful. In addition, using WindTunneling to prepare for “in person” meetings, either on Skype or in the office or at a conference can bolster productivity and attendance. People come with a rich picture of the ideas that the participants are bringing as part of their preparation, thus affording the in person time for deeper conversations. Our experience with dozens of people sharing ideas is that we end up with so many ideas that it appears to be chaotic, and we’ll never be able to make sense of all of it. Consider that we are inviting divergent perspectives, and we are striving to hold open a space to entertain possibilites and new patterns and relationships. WindTunneling lets us organize and display ideas in a non-linear way, and enables us to then begin to “make sense” by responding to either a given contribution, or to a group or the whole. We have rounds that enable us to aggregate are “second order” or more mature relfections….and then see what other people see as they review the whole. We have assessment processes to distill further the group’s sense of what is significant and what is less significant. The Matrix and the Emerging Insights activities are refined pathways to engage hundreds of ideas and move off line to let our hands help us “cluster” patterns and themes, submitting our small-group insights back in for every participant to review. WindTunneling enables new options for leaders, options that reflect the perspectives of all participants as they evolve from pools of ideas into more firmly formed options for action.